Race Officer John Beavis ably assisted by Kay and Inez set Lizzie the committee boat over on the eastern shore near the Water Tower. Now was the wind north or northwest? The line was set and the courses given. North for the M class, two Firebirds, fresh from their Championship, Northwest for the other classes. It was a difficult call! Well, Ultraviolet, Peter Stephens and Alistair Wright made a great start near the pin end in wind and tide. Cornish Meadow, Steve Hutt sort of made it a few minutes later somewhere down the committee boat end. They had a good race and the result was as the start. Ultraviolet took line honours. The wind was fickle but stayed for the most part in the NW and so Q class lined up for the start. A gaggle of yachts led by Scorpion, Geoff Davies came down the line on starboard heading toward the pin end where there was more wind and flood tide to take them up to the windward mark. Quite a way in front was Per Elisa, Robbie Tregear but they were rapidly running out of line length and stood the risk of overshooting the pin before the gun. A quick tack back on port toward the advancing hoard, all of whom had right of way, looked decidedly dodgy, A quick tack back onto starboard and a good attempt at lee bowing Scorpion and forcing her over the line gave Per Elisa the Goldilocks start. Off they went with Rampage, John Hicks hiking up to windward of the rest and looking in a commanding position. An impressive fleet of 13 yachts. Five minutes to go so we hoisted our genoa on Trifle and turned back toward the committee boat. There were 11 yachts in U class all down the committee boat end each vying for the perfect slo. Matt my foredeck crew was calling out the time and I made a decision to start middle line toward the pin end in clear air. We did a 360-degree circle to soak some seconds and then with 45 seconds to go made a conscious beat for the line. Clear air and top speed! We hit the start at full pelt. I looked behind and saw Kaimana, Nigel and Jess Rowe to windward off me with a great start. We were lifted toward the Vilt buoy and after a short tack followed by another rounded the buoy well ahead of the others. A starboard hoist kite led us toward the Carricknath Buoy. Dead downwind and up tide. Deep Purple, Ron Jones with his gigantic kite then went over the top of us and took the lead. Still, we held off the rest of the fleet. Three Sunbeams then started in V class, sorry guys couldn’t see your start and you didn’t come back to the club to tell me what happened. Pixy, Lyulph Hesling beat Ivy, Nigel Glanville and Mary, Neil Hopkins. G class went Backwards (literally) up the river. Why? Dunno but they do it. It's a gaffer thing. Dragonfly, Mike Maguire beat Clementine Alan Perham and Miss Agnes, Mike Rangecroft. Six of them disappeared up the river and back down again, in the first of their unusual racing Quests for the season. Nine glorious working boats went for an 1845 start and enjoyed the wonderful soft evening wind and subsequent racing. David Carne told me later in the bar that Victory, who took line honours, was a slower boat to turn with regard to some of the younger working boats. “We have to cover them with a big margin”, or something like that he said. Any way she won beating Winnie, Arthur Williams and son Artie by 45 seconds on handicap. As we were packing our sails away we could see the wonderful sight of the working boats coming up the harbour with the crews giving three cheers to their rivals as they crossed the club line. Nowhere else in the world will you ever see such a wonderful spectacle! 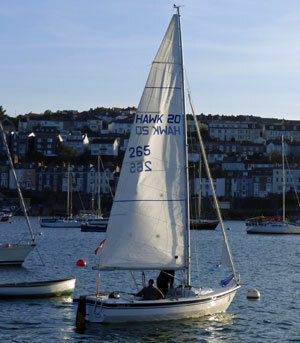 Q and U class joined up at the entrance to the inner harbour and crews worked hard tacking the yachts against the wind and ever-increasing ebb tide. On the final beat from Castle Buoy having led most of the U fleet we discovered a large hole in the wind just between Governor and the Docks. Our lead suddenly diminished and 4 GK24s and Quicksilver, Jeremy Windebank looked like they were going to catch us. We tacked across toward the Trefusis shore and got more breeze and a lift up the shore ensuring 2nd place over the finish to Deep Purple, Ron Jones but 1st place IRC handicap. Per Elisa had a resounding victory being 5 minutes ahead of Rampage. Temeraire, Martin Eddy some 5 minutes behind Rampage to take 3rd slot. Trifle, Chris Jelliss won U class with Mary Boon, John Cruise 11 minutes behind coming 2nd on handicap. Kaimana, Nigel and Jess Rowe were 3rd. The club was full to bursting with crews on the quay enjoying the evening sun. Thanks to John Beavis the race officer and all the committee boat staff. Jeanette spotting and Sue Clark for the results. The two Jennies for a busy bar, Lyn the new girl in the ops room and Hine Downing our sponsors.